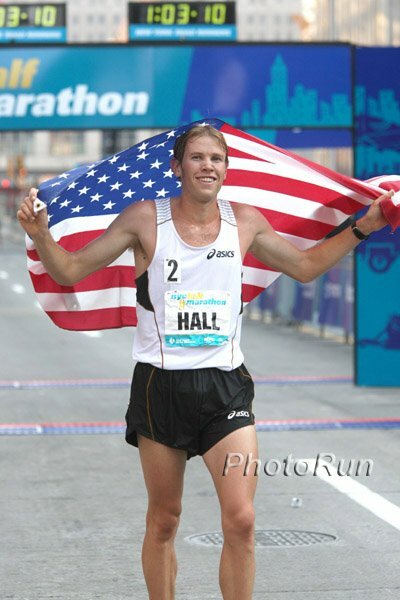 Race #2: Hall Hammers 4:27 13th Mile To Win in 61:52!!! NRR: Grad School - Ithaca, Nashville or Pennsylvania? No Love For Martin Lel - Faces Gharib In BUPA Great North Run (1/2 Marathon) This Weekend Philly, Providence, Berlin, Great North Run ... Who can keep them all straight? '09 Boston Marathon champ Salina Kosgei highlights women's field in a race being overshadowed on a busy weekend in road racing. No Surprise: Email Records Show South African Administrators Are Lying About Knowledge Of Pre-Worlds Tests We'll have more on the latest dirty secrets from the Caster Semenya saga on Monday. Amazing Moment Rekindled: Remembering Derek Redmond's 1992 Olympic Moment Where His Dad Helped Him Across The Line President Obama brought up the story while doing a little stumping for "Chicago 2016." 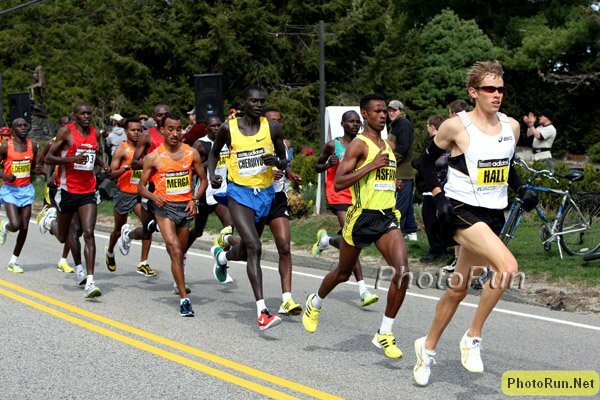 Excitement In Providence As Sub-13:00 Tegenkamp Will Race Famiglietti At CVS Downtown 5k CVS Is Sunday. Can Matt Tegenkamp get the US road 5k record? Interview With Tegenkamp Pre-CVS Teg: "This is icing on the cake for me. I don't feel stressed or tired." Can Distance Runners Learn From Sled Dogs? Read This Development In Sled Dog Racing Our friend emailed us the link to this National Geographic article discussing sled dogs and their new racing strategies. It used to be that the dogs would race for 6 hours, rest for 6, and repeat. But now mushers have found that on a fat-based diet, the canines click into another gear after many hours of running and can now run for up to 14 hours straight. *Strangely Inspiring: Cross-Dressing British Comedian Completes 43 Marathons In 52 Days It goes to show where there is a will, there is a way. *We Would Hope So: WADA Upset With Frequency Of Russian Athletes Testing Positive Lately most of their dopers have been caught in skiing events. 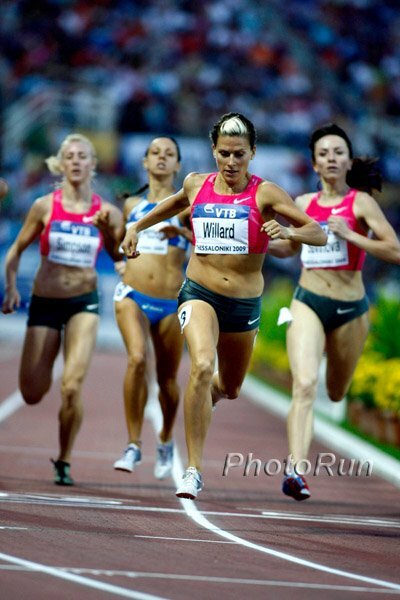 LRC: The Week That Was This week, the 2009 track season came to a close with the World Athletics Final (WAF), where Anna Willard and Kenenisa Bekele impressed us once again and Usain Bolt was upstaged by Carmelita Jeter as everyone paused to ask, "Is she clean?" Plus some fine road racing performances by Brett Gotcher and Colleen De Reuck in New Haven, as well as Sammy Kitwara in Rotterdam. And even though he got crushed, we tell you why it's time to get excited for Sammy Wanjiru's run at the BOA Chicago Marathon in less than a month and prove once and for all that we don't hate the Oregon Ducks. 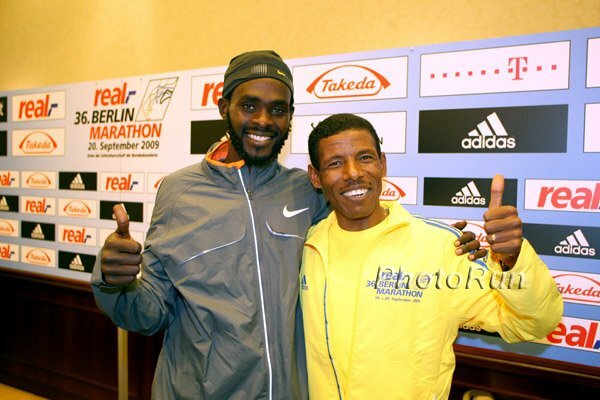 Berlin: Kibet vs. Geb Was Sunday At 3 a.m. EST! Geb Goes After It But Fades After 35k!! The great one went after the WR in a major way hitting halfway in 1:01:44 and staying on pace until 35k but he ran the next 5k in 15:57 and had to settle for a 2:06:08 win. In hindsight, the heat may have been too much or the pace a little too hot. *Race Re-Broadcast on Internet Here *Race Will Be Re-Broadcast On Universal Sports TV At 5 pm EST (Now On Directv #604) Let's hope it's rebroadcast then as like competitor.com, universalsports.com blew it as well as the supposed 'live' internet stream was more than 45 minutes delayed, leaving LRC fans irate. *LRC: Employee #1 Predicts New WR - Do The Stats Back Him Up?